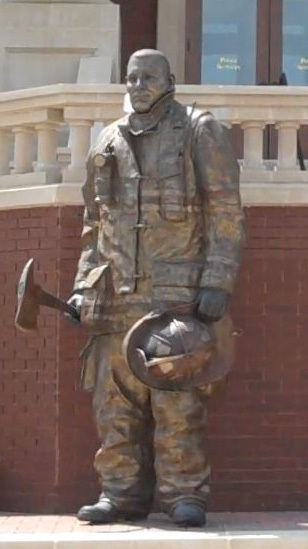 10 ft. tall firefighter statue, Southlake Texas. Fire Service FAQ's, Trivia and Questions & Answers. Be sure to try our new EMS Glossary page or the Fire Service Glossary page. NOTE: Even though we have traveled to many fire departments and communicated with hundreds of fire service people, all over the world, we will undoubtedly omit terms and traditions. If you have a question or know of something we have left out, please help me make this site more accurate by letting us know. Here are some of the questions we have received. The answers for all are below. Just click on the one you want. Is there any truth to the belief that the full moon makes busier nights for emergency workers or hospital ERs? What is a "Wet down Ceremony"? What do the stripes and stars on the sleeves of, fire department dress blue uniforms represent or signify? Can you explain the push or trend towards "4 man staffing"? Why do emergency services tie up traffic for so long? Why do they block so many lanes on a freeway? Why do fire stations have red lights on the front. How do cities decide how many fire stations or fire fighters they should have? Why do firefighters work 24/48? What do "chief's drivers" do besides drive a car? Why do we need them? What should I do when I encounter an emergency vehicle on the roadway? Why will you see a fire engine driving down the road, with lights and siren on, and then just turn them off and go to the store etc.? Can emergency vehicles change the traffic lights? Why is it called a fire �plug�? What is firefighter protective clothing made from and how does it work? How do firefighters see in smoke? What is the difference between an �Engine� and a �Pumper�? What did those �tones� on the show "Emergency" mean? What is in the breathing tanks? Is it oxygen? What do the horn shaped insignias you sometimes see on clothing mean? How do wild land firefighters put out forest fires with an ax, shovel, and a chain saw? How do firefighters know how many hose lines and fire trucks are needed to control a fire? What is the difference between �Under Control and �Out�? How many women are in the fire service? Are all EMS systems run by fire departments? Why do firefighters wear red suspenders? How do fire boats work? How do military fire departments work? How do those big fire trucks at airports differ from municipal fire apparatus? What is the National Fire Academy? Why do even some small fire departments have apparatus numbers that are two or three digits? Some departments have "Kelly Days". What is that and where did the term come from? What is a multi-alarm fire? As in,"The fire was 3 alarms." Why is it called "Turnout Gear"? What is a "Command Technician"
Be sure to try our Glossary page. Is there any truth to the belief that a full moon makes busier nights for emergency workers or hospital ERs? In a word, NO. There have been countless studies on this myth that show there to be no correlation between busy nights and a full moon. Before everyone writes us emails, please read the following. This is a ceremony to put a new piece of apparatus in service. Here is what happens. 1. The chief, and other esteemed people, photographers and etc. are gathered at the station along with the new and old apparatus. 2. The old, (retiring) piece of apparatus is PUSHED out of the station. 3. The bell is removed and installed upon the bumper of the new apparatus. 5. Sometimes there is a special ringing of the bell and perhaps the station speakers are opened, at all stations, to announce the event. 5. The new apparatus is PUSHED back into the station to start its life as a member of that department. Where did this tradition come from? Here is were we have to make some assumptions and draw some conclusions. The pushing probably goes back to the use of horses. They probably wouldn't hook up the horses for this, for several reasons. The "wet down" may go back to the christening and naming of fire equipment. (This is talked about this on the history page.) The moving of the bell is a great tradition. The bell should stay with the company and be passed down forever. The bell could be hundreds of years old someday. Before you think negatively about this practice, please consider this. Traditions are very important in the fire service. They are how we pass down the pride and commitment to those who follow us. In this case, a photo of the crew, with the new apparatus is placed on the wall of the station and becomes a part of the heritage of that company. It might be fun to see what the captain looked like twenty-five years ago when they put that "old" truck in service, when he was just a firefighter, but it is more than that. These traditions are a link to our past, and to our future. Captain with 15 years service. 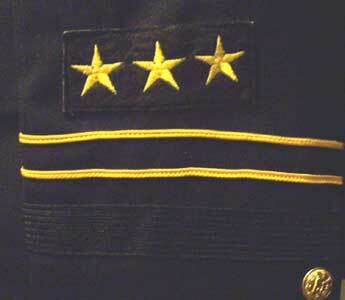 What do the stripes and stars, on the sleeve, of dress blue uniforms signify or represent? The basic rule of thumb: Each star = 5 years of service. The stars can be actual stars or maltese crosses. For most fire departments, the stars (or crosses) signify time in a fire department. Each star usually represents five years. This often will depend upon the type of department for which the person is wearing the uniform. For example, if you were a volunteer for ten years before becoming a paid firefighter you PROBABLY would not have three stars on your uniform after five years on the paid department.Many departments have people who were volunteers before getting on. The stars on their sleeves represent the number of years on a paid department. We should probably point out that it does not mean the number of years on our department. If this were true then the chief of most departments would often have few or no stars. This is because they are often hired from other departments. There are probably all kinds of exceptions to this. There are paid departments which are created from volunteer organizations. Some VFD's may want their volunteers, who are also paid firefighters to show their experience on their blues. The variations are probably endless. 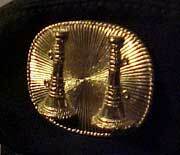 The piping usually signifies the officer's rank. A lieutenant is one stripe, a captain is two stripes, etc. It is reflective of the number of "bugles" the person wears. 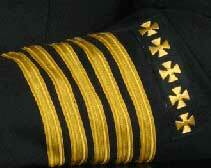 Sleeve on a chief's uniform. This is a popular and complex question. There are probably people better qualified to answer this question, but here goes. There are many paid departments that have already been able to get their cities to pay for four people on every piece of equipment. Some have had it this way for decades. In areas where there is collective bargaining and contracts are signed, this subject is often brought up and dealt with. In cities without contracts, all the departments can do is ask for more people. But do we need them? You will find all kinds of positions on this subject. There are many factors that suggest that we do need four people on each piece of equipment. Here are just a few of them. We always work with another person. No one should ever be alone. For this reason, three people is still just one crew. Four people can be divided into two crews. This means that the addition of just one more person can result in twice the work being done or twice the area being covered. There have been extensive studies about this. Recent changes in regulations like OSHA or NFPA require that if two people go into a hazardous environment, or situation, that there needs to be two people outside ready to rescue them. This is often referred to as "2-in / 2-out". Unless there are four people on that first arriving piece of equipment, that crew will have to just wait until another company gets there. In the past, a theoretical score from the ISO (See Glossary) usually determined a homeowner’s insurance rate. Part of that score dealt with the number of personnel on hand. Now in many states the same insurance companies set the rate based upon the actual fire loss in a zip code. (See ISO) The sooner firefighters can be on the scene and can begin operations the less fire loss there is. The amount of loss can be directly related to the number of firefighters who get there early. So there might still be an impact on insurance rates by having more people, even if your rate isn't based upon ISO . We want to save lives and property but we also want everyone to go home at the end of the shift. Four people is just safer. (See #2) Almost no one would argue that having more people is not safer. But some would argue that there are other ways to put more people early on the incident scene. One method might be to create a "squad" of firefighters that respond to every structure fire. This is usually a vehicle, such as a suburban, equipped with SCBA, some hose line, hand tools, etc. Usually this vehicle is staffed with four firefighters, These units are then stationed strategically around the city. Another way is to equip and man MICU crews for firefighting and dispatch them to structure fires. Some cities have chosen to put four on a truck and leave three on engines. Others have decided to do the opposite. The variations are endless. Recent federal mandates have prescribed that emergency scenes need to be protected better than in the past. More lanes will be blocked, for longer, in order to achieve this objective. Another reason for delays in opening freeways is this need to involved multiple agencies. There are any number of circumstance where water departments, medical examiners, water departments, health departments and state or federal agencies must be summoned and arrive before any work can be done to open the roadway. For even more information, on this subject, go HERE. Why do fire stations have red lights on the front? A question often received. In truth it should probably be, "Why do some fire stations have red lights on the front? The usual reply is: "Ask the department where you see the red lights. (And let me know.)" The fact is that some do and some don't have red lights. The lights could be there for a host of reasons. - Some communities have just chosen to have red lights to signify a fire station. - Perhaps it guides someone to where the night doorbell is. - Some used lights to signal an alarm. - Some indicated that the doors were about to open or close. - There could be some local tradition. 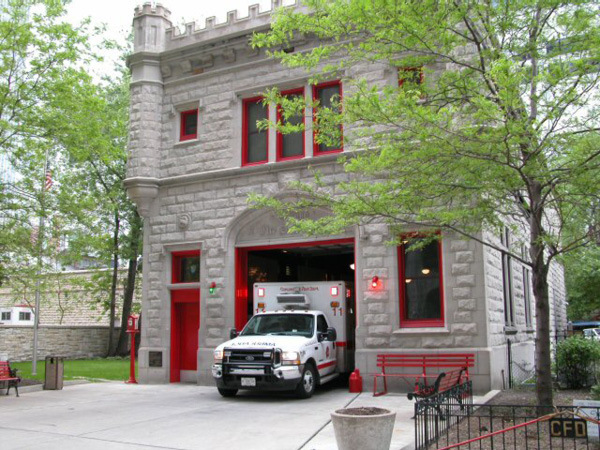 If we imagine fire stations in old downtown areas, such a Chicago, Detroit, San Francisco, or New York, we can see them on streets that have almost no area between the doors and the street. Furthermore, fire stations were often in the center of the block. looking down the street, a fire house would look like any other business unless there was something to set it apart. Red lights served the purpose well to let people know it was an emergency facility and to possibly warn that horses or apparatus could bolt from those doors at any second. There are probably still many stations still located on the street curb in many U.S. cities. When the population shifted to be more suburban in the mid- Twentieth Century, many fire departments discontinued the practice of red lights because fire stations had large signs, flagpoles and other ways of standing out. 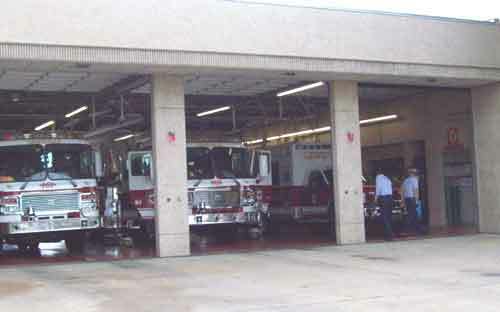 Lewisville Texas is a fire department known for being traditional as well as progressive. The chief, Rick Lasky, writes for fire service publications. He has a book out about fire service history and tradition. He is from the Chicago area so he has a background in departments with long histories and traditions. We have been told that Chicago fire apparatus have red and green lights because they had a fire commissioner whose family was in the shipping business. (Albert Goodrich. He served from 1927-1931.) These lights were somehow transferred to the stations. So Chicago stations may have red and green lights. (Good Photo Here) Some smaller, Chicago, area departments probably inherited chiefs from Chicago and they imposed this tradition upon their new departments. To support the assertion above we can refer to a Q & A trivia article in Fire Engineering magazine. "Q: The Chicago Fire Department has many traditions. 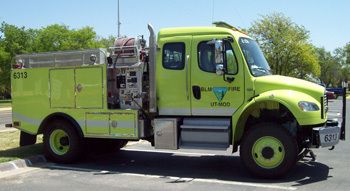 One is that a fire apparatus display a green warning light, usually on the officer's side of the apparatus. Why does it do that, and how did the tradition start? A: A former CFD Commissioner was a boating enthusiast. He felt it made sense so on-scene commanders could determine the direction from which the apparatus was responding." The Chief of this department explained that this was something that he had asked for, since the day he took office. He reaffirmed that these lights were to allow people to identify the stations in the old days, in New England, when there was a zero setback for the old urban stations. He also talked about how these lights were, and still are, associated with the old pull alarm boxes in places like N.Y. If you want to know why a particular department uses a red light, I suggest you ask that department. How do cities decide how many fire stations or firefighters they should have? This is an excellent question. If only there was a simple answer. It is often asserted that determining how many firefighters are needed on duty is more of a political and financial decision than just about anything else. We would all like to have a fire station on every corner, but that is just not possible for many reasons. There are many factors involved. In some states the firefighters have the right to "collective bargaining". In this process the firefighters and the city decide upon a contract that defines the pay, benefits, responsibilities and personnel strength of the fire department. In much of the U. S. no such contract exists. City management is free to do whatever they feel is best. This is not to say that they can do anything they want. Cities are still run by politicians or the people appointed by politicians. If the citizens do not feel that they are being properly cared for or that their tax dollars are not being spent correctly, someone may be held accountable. In most cases the fire chief and sometimes the firefighters association will have valuable input. Cities in the same general region of the country will often be set up similarly. But the farther you are apart, the greater the differences might be. Let's compare four very different departments, Irving, Texas, Newton County GA, North Bay, ON, and Manchester, New Hampshire. These departments have a similar number of firefighters and stations, yet they are very different in population and land area. 12 Fire Engines with some quints/trucks. Land area served about 278 sq miles. 3 Fire Engines with some quints/trucks. Land area served 314.91 sq KM (121.6 sq mi). As you can see, there are big differences in the level of protection each city has chosen. Or is there? Manchester - 1 firefighter for every 428 citizens. 1 station for every 9727 citizens. Newton County- 1 paid firefighter for about ever 1000 citizens. (But one paid and 1 vol. FF for every 500 citizens) 1 Sta. for every 6417 Citizens. North Bay, Ontario - 1 firefighter for every 662 citizens. One station for every 18000 people. On the surface it appears that Irving has about half the protection that Manchester has. Irving has twice the land area, and almost twice the population. Newton county has much more land area but half the population. And yet they have about the same amount of firefighters. If you remove the EMS personnel needed to staff 6 MICU's, from Irving's stats, you see even more similarity in the number of firefighters hired. Both Manchester NH, and North Bay, ON, have four shifts/platoons so the number of people actually on duty must be divided by 4, instead of three, as in Irving or Newton county. When you compare Rochester and Irving to Newton County there appears to be differences, but are as drastic as it may first seem? Are there valid reasons for these differences? I am sure that the government of all these cities think so. You have to consider many factors. These are very different fire departments from very different communities. Manchester is older. Irving has some of the toughest fire codes in the nation. Newton Co. is spread out. Manchester has collective bargaining. 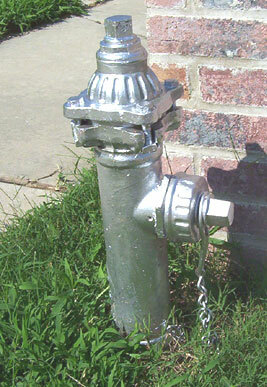 Irving has an excellent water supply system for fire hydrants. Manchester is in the north east where winters are harsh and keeping warm, in older buildings can be a cause for fires. In parts of Newton Co. and North bay, obtaining water might be a problem. There are probably other huge differences as well. A large number of the structures in Manchester are buildings that are three story, wood frame and four feet apart. When one catches on fire you can often lose three. It's also just a fact of life, fire departments in the north east are very different than those in the south or west. I am sure that all four city governments are trying to do their best with regard to protecting it's citizens. Not only that, but the fire chief of each department certainly has a say in what is needed to protect the city. The money available is another unfortunate fact. One must consider the tax base and the cost of living in each area. I have no idea what the tax base of Manchester is. If you consider that Irving and Newton County works 24/48 and Manchester is 24/72 and North Bay used a four platoon 10/14 schedule, the ratio of people on duty to population becomes not so dramatic of a difference. 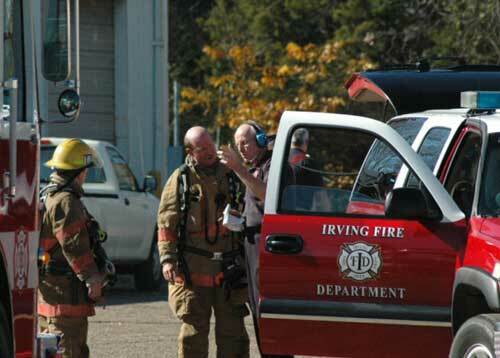 Irving can have almost 100 people on duty while Manchester will have about 50 each day. Newton County may only have about 20 people on duty but they have a reserve of up to 75 volunteers to assist them. North Bay has 20 people on duty every day. If you look at it this way then fire protection is about the same. It is easy to see that there are may factors that go into the decision of what is the appropriate number of firefighters a department should have available. The types of buildings, the climate, if EMS is run by the fire department, the work schedule. Some people will attempt to apply a "rule of thumb" that says, "One firefighter for every 1000 people in population." This simply does not fit most fire departments. When we try to determine how many firefighters we need, we also have to consider all the other ways that cities have tried to accomplish that number. This includes volunteers and PSO departments. For years the ISO was a big factor in deciding staffing for fire departments. In many states this is no longer the case. Georgia is one of the states where the state government requires ISO to be a factor in the insurance rates and therefore they have major influence on fire department staffing and equipment. Why do firefighters work 24/48, or other strange hours? This question has both a simple answer and a very long one. I will do my best. Simple Answer - Because they can. U.S. Labor laws, which regulates when you have to pay overtime for working more than 40 hours a week, exempts firefighters. Long answer - Many fire departments DO NOT work 24 /48. Some states require the paying of overtime (1.5 X reg. pay) for hours over 40, even for firefighters. Some states have unions and collective bargaining and the firefighters have a contract that gives them something other than 24/48. There are many kinds of schedules. - 12/12 for so many days then a certain number of days off. - Four - 10 hour shifts a week. - On the west coast you can find firefighters who work 24 on then 24 off for a period then have a long time off. 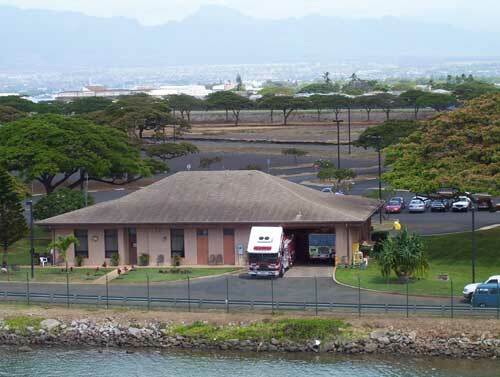 - The Maui (Hawaii) fire department works 24/24 as above but they have one station on the island of Lanai that is considered a remote station. Here they work 3 days on and 6 days off. - Just about any combination is possible. Some departments have people who just work weekends. They will work 40 hours just on Friday, Saturday and Sunday. They will do this by working something like two 14's and a 12 on those three days. Federal law allows firefighters to work only 53 hours before it is required that the employer pay "time and a half" for hours worked. If you do the math you will see that, on average, a firefighter on 24/48 works seven shifts in a three week period. This adds up to 56 hours a week. There are several methods used to prevent those 3 hours of overtime. Although some cities just pay it when it happens. This question probably refers to Battalion Chief's drivers. At first glance it may look silly to have someone whose job it is to drive a chief around. But in reality, the job(s) that a Battalion Chief is often called upon to perform, is really a two person operation. Besides the day to day logistical paperwork and time spent on the phone that takes up much of the chief's time, there is the chaos of an emergency scene which requires a great deal of communication and information coordination. Daily Operations- The Battalion Chief is really the person who insures that day to day operations are possible. Consider this: there are 168 hours in a week. In most departments, staff officers, such as higher chiefs, only work 40 hours a week. For most of the time, the Battalion Chief is the highest ranking officer on duty. Note: as mentioned elsewhere on this site, the really large departments might have district chiefs on duty 24/7, but that is rare. He or she has to insure that all positions are covered. For example, in just a few minutes, before the oncoming shift starts and outgoing shift leaves, the Battalion Chief must make sure that there are enough people on duty. Does this sound easy? Imagine having 50 people who work for you. Each person has a very specific role and every role must be covered. You might have one or two extra people on some days, but what if too many people call in sick at the last minute? What do you do? Perhaps you can hire an overtime firefighter, who is not a paramedic, but you need a paramedic on an MICU. Do you get on the phone and hope you can find a paramedic who can quickly come in? Do you move four people around so you can finally put that firefighter where you don't need a paramedic and move the paramedic from his station to the MICU station? This is just one job that a BC may face every day, and the shift hasn't even started yet. Schedules have to be planned in advance. Vacations need to be scheduled and assignments need to be considered. If a firefighter gets injured or a vehicle has an accident, it is the Battalion Chief who makes the initial investigation report. The list of jobs and responsibilities can go on and on. In some departments the Bat. Chief oversees training. The Battalion Chiefs pretty much run the fire department. Every detail of the battalion is handled, in some way, by the BC. Sometimes a decision is made to take an issue to a higher level, but that is rare. The Chief of the Department is on duty only 24% of the time, and yet he or she has a large staff of people to help. The other 76% of the time the Battalion Chief(s) run the department. * Please don't write us. We know that staff officers have completely different, and very complicated jobs. They are also usually on call for any large emergency. The point is, that for day to day operations, the BC is THE highest ranking person on duty, for most departments. Shouldn't he have an assistant? Emergency Scenes- The average person probably can't imagine the complexity of the situation at a fire or other emergency scene. The command officer is bombarded with information and communications. Decisions need to be made quickly. The Incident Commander can't be spending all his time writing down information, talking on the phone or radio, and making decisions based upon that information. In many cases there are three radio frequencies that have to be monitored. A record of who is where and what they are doing must be kept. Once a decision is made, those units must be informed of their assignments. These actions take away the ability to manage other information and make more decisions. But if the Incident Commander has a "Command Technician" (or "CT") to assist him, operations at command run much smoother. Note: Like I say so often, different departments may use different names for this person. They may be known as a "Command Assistant" or by other names elsewhere. Command Technicians are trained in communications and organizational skills. This is a person who must be able to take in information and organize it, as well as, present it to command in a way that makes sense. He needs to know the systems and equipment of the command vehicle. Think of the old war movies. Is the officer making the decisions, the actual person who is carrying, and talking on, the radio? Is the commander the one getting information about units and drawing on a board? No. The radio operator, even in a small unit like a platoon, relays information to, or from, the officer. The fire service works much the same way. In the best, complicated, emergency scenes the command officer may never talk on a radio. In really big fire or emergency situations, you really need two command technicians. You need one to organize incoming information and one to talk on the radios. In the really big operations, those that last for a day or longer, command will assign people to take care of command functions. He may assign officers to Logistics, Public information, etc. He may assign someone as a liaison to other agencies such as law enforcement or the Red Cross. Each one of these officers could probably use an assistant as well. But in most situations, the Incident Commander will cover all these functions. He or she will talk to the Red Cross, the police department, the media, call for assistance in many ways and make decisions about actual operations. See why an assistant is needed? In this photo, the Command Technician is relaying instructions, from command to an officer. You can spot the "CT" because he is wearing the headset. The Incident Commander is probably to the rear of this vehicle looking at information or talking to someone else. You will often hear Aerial Platforms referred to as "Cherry Pickers" by the news media. We have spoken to several firefighters and we all agree, we have no idea where this term came from and how the news media came to use it. We have never seen platforms referred to as this in ANY fire service publication. Has anyone ever heard a firefighter refer to a "Snorkel" or other apparatus by this name. If anyone uses this term one might suspect that it would possibly be only "CHERRY GROWERS"! Note: There may have been a time when fire departments borrowed agricultural equipment, for rescues, in some communities. But how long ago was that? If the emergency vehicle has lights and siren on, you should pull your vehicle to the RIGHT SIDE of the roadway and STOP. You should signal as you do this, if possible. Many people will stop their cars right where they are. Every day we have to weave between vehicles or go into opposing traffic because people do not seem to know what they should do. It is also important to note that many states have very strict laws regarding what you should do with emergency vehicles on the roadway. There are MANY states that prohibit you from passing an emergency vehicle, with warning devices on, at any time. Except on highways, you should stop for emergency vehicles. We have people try to pass behind and between us and our station, as we are backing in, almost every day. Can you believe this? We are backing up, with our lights on, and they are driving behind us. Please keep this in mind. If an emergency vehicle is stopped, in the roadway, with it lights on, personnel are probably working around it or are just about to bail off of it. Why will you see a fire engine driving down the road, with lights and siren on, and then just turn them off and go to the store? Believe it or not, we aren't just using our warning devices to go to the store quicker. Emergency vehicles are very often "disregarded" from runs. In the case of a structure fire, several companies are dispatched. When the first arriving unit "checks out", they are often able to report that the fire is out or perhaps it was a false call. In this case all the other companies get to turn off their lights and go back to the station. Very often we will have the need to pick up something at the store but we will "wait until we get out" to go. Yes. Many cities have installed a system where emergency vehicles can change a red light to green. Each vehicle is equipped with a small light emitter. To the eye this looks like a series of rapid camera flashes. A receiver on the traffic light pole will sense the special coded frequency of flashes and turn the light green for that vehicle, and red for everyone else. These can 't be used just to get around town for several reasons. Many of them are connected to the light and sirens. It is not on unless everything is on. They also keep a record of each use. It is possible, through data kept to determine which vehicle triggered the device at exactly what date and time. Contrary to what you might have seen on a recent episode of "Lie to Me" these aren't hand held devices the size of garage door openers. Why is it called a fire “plug”? You are correct to question this. They are really hydrants. But terms and traditions linger in the fire service. Many years ago water mains really had wooden plugs. During a fire the firefighters would dig down to the main and drill a hole to get water. After the fire a wooden plug was driven into the hole. Firefighters tried to remember where all the plugs were because it was easier and quicker to knock out a plug than to drill a hole. A fire fighter would simply use an ax to knock the plug out. Sometimes all this would do is fill a depression in the ground so people could scoop up water in buckets. Later, water would be drafted out of the mains. These mains were sometimes made from wood or other material. These 2 1/2 inch hydrants (?) were found in a residential area in Flower Mound, Texas. So far only three of these hydrants have been found. 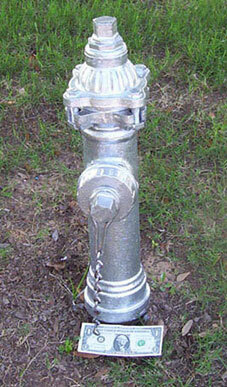 Update: The Fire Chief of this department sent us an email about these hydrants. Apparently they are installed on dead-end water mains to occasionally flush the system. If they didn't have them, sediment would accumulate. They are not intended for fire protection use. The "Turnout Gear" is made from several layers of different fabrics. These include: PBI, Kevlar, Nomex and others. They form both a protective shell and thermo-insulating barrier. It depends. Often they simply don't. A great deal of firefighting or searching is done by feel. The glow off the fire or flames is sometimes all you see in the beginning. There are devices that allow firefighters to see in smoke quite well. But these devices are usually not available to every firefighter on the scene. They are usually for very specific purposes. See, "Thermal Imaging Camera" in our glossary. What is the difference between and “Engine” and a “Pumper”? Not much. These are usually just different terms for the same thing in different parts of the country. "The search for, and extinguishing of hidden fires." What did those “tones” on the show "Emergency" mean? The speakers at each fire station would only come on when a message was for one of the companies at that station. This way personnel did not have to listen to all the calls at all the other stations. The speakers were activated by something probably called a "Plectron" system. Each station's radio was sensitive to only two tones and the interval between them. Think about it. If you have just 7 notes, you have 49 variations of tones. Add to that certain other features and you can have a code for many different stations. Today this is often done by the transmitting of a digital signal that tells a station's radio to come on and broadcast the message. What is in the breathing tanks? Is it just oxygen? No. It is the same air we all breath. If you can imagine a container that is about 4ft X 4ft X 4ft, that is about the amount of air that has been squeezed down into a cylinder. Each tank is rated to be able to supply 30 to 45 minutes of air depending upon it's volume and pressure it is rated for. But this is based upon no exertion at all. A fire fighter is doing good to get 10-15 minutes from a tank at a fire. Note: there are cylinders that hold more air and even some that contain less. The fire service is slowly moving towards higher pressure systems that have more cubic feet of air. What do the horn shaped insignias you sometimes see on clothing or helmets mean? In the early days, of North American fire departments, orders were given to the troops, by officers, by speaking through a device that resembled a megaphone. These were very ornate brass horns. 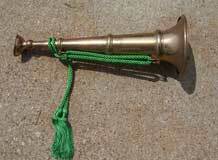 They were commonly called “Bugles” or speaking trumpets. This was the major means of communications on the fire ground for over 100 years. 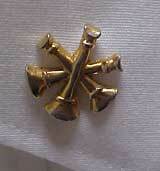 A "Bugle" and a type of Chief's collar brass. Officers were the only ones allowed to use this object so a small pin in the shape of a bugle became a type of rank insignia for officers. The more “bugles on his collar” the higher the rank. An expression still used today. See: Ranks and Organization. How do wildland firefighters put out forest fires with an ax, shovel, and a chain saw? It is amazing that people on the ground with such tools can help to control a forest fire. Wildland firefighting has become a specialty. These operations can last for days or weeks at a time. The skill to manage such an operation is a specialized discipline and requires a staff of trained competent specialist. Special equipment and apparatus are also employed. The most spectacular might be the airdrops. Examples of other equipment designed for the job might include the two vehicles pictured below. 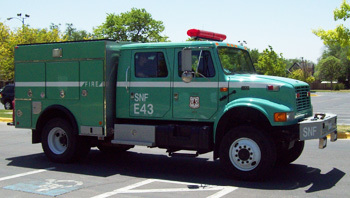 One is a BLM fire crew vehicle, the other is a Forest Service engine. Good question! The following sites are suggested. There are several methods and "Rules of Thumb" that help us do this. The best methods involve experience and pre-fire planning. It is not uncommon for an officer to respond to several fires at the same apartment complex in his career. Past experience can help him or her decide what is needed on this or similar fires. We also drive our districts and visit businesses to establish plans for if a certain location has a fire. Another method that helps is an accepted mathematical formula for an estimate of the needed fire flow. If you take the area of each floor on fire (Length X Width) and multiply this by .33 (one third) you will get a very rough estimate of the number of Gallons Per Minute (GPM) you will probably need. Think about this. Some warehouses might be 30,000 sq feet. If half of this building is on fire, you might need 5000 gallons per minute to extinguish it. This is much more than one or even two standard engines can provide. What is the difference between “Under Control" and “Out”? "Under control" generally indicates that the fire is no longer spreading. There may still be some overhaul needed. If the fire is reported "out" this means that there is no longer any fire to be dealt with. No. There are many variations. Fire Boat, "Chief Seattle" Seattle FD - Click on photo for more. When someone says "fire boats" we often we think of the vessels that can draft very large quantities of water from the ocean or other bodies of water. These pieces of equipment can supply many thousands of gallons of water a minute. 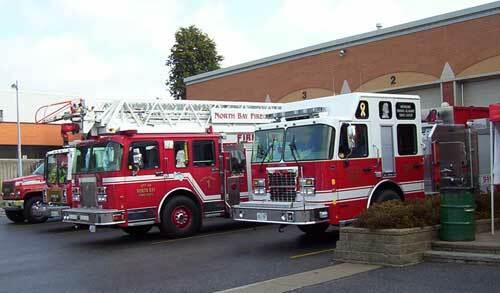 They can fight fire directly or supply water to land based apparatus. This is also often the generic name for any watercraft operated by the fire dept. It may be a small raft or outboard used for rescues or ferrying equipment to a location only reachable by water to a slightly larger boat with a portable engine pump up to an ocean going tugboat capable of pumping the equivalent of 20 land based pumpers. Barges or large rafts are sometimes used to carry several portable or trailer pumps ranging from 100 gpm to 10,000 gpm each, were used extensively in England during WWII. Military departments are often a combination of military personnel and civilians. Of course this depends upon the situation. There will be less civilians in a war zone than at a military base in the states. Some bases may have only civilian personnel. Some may have only military. Update: Having said that there are fewer civilian firefighters in a combat zone, I should probably correct something. At this moment there are hundreds of civilian firefighters in Iraq who are employed by the U.S. There are approximately 30 fire stations being operated by a U.S. company in that combat zone. One of the biggest overseas contractors for firefighters is currently KBR. Another company is Wackenhut (WSI). First off, they are not "trucks". They are pumpers or rescue vehicles. They can differ in several ways from a regular engine or pumper. They usually can carry and pump larger amounts of water or foam. They can usually direct foam or water, from a turret mounted nozzle, from inside the cab. They may have a boom that extends out from the vehicle to enable them to put foam exactly where they want it. This could be for any one of a number of reasons. A city may have several engines at one station. For example, if Station 5 has three engines, they may be numbered, "Engine 51", "Engine 52" and "Engine 53". A city may have stations numbering 1-5 but also have a "Central Fire Station". The apparatus at this station might be numbered "11" or something else. Traditional fire apparatus numbering did not allow the use of a "0" for identification. For decades, apparatus was dispatched by ringing a bell. A "box" or a piece of equipment was identified by a series of bells. A signal of 2 bells then 3 bells meant box or station 23. They did not have a way to ring a "0". They also did not want to ring nine times so the largest number of bells was five or six. This means that you could not ring a "7". After five or six the number might be "1-1" Strange (but very efficient) numbering systems and codes evolved from this. Chief officers will often have three digit numbers. This is often derived from the number the city has designated for the fire department. If the fire department is "Department 5" to the city government, then the chief of that department will be "500". Assistant chiefs will be "501", "502" etc. In some cities the vehicle numbers will reflect the department number. The engine from Station 1 might be called "Engine 501" or even "Engine 511". You never know. There are other numbering systems as well. The number above is from the Lewisville (TX) Fire Department. This does not mean that they have 165 MICUs. They participate in a large mutual aid system. The 160's belong to Lewisville. It is from Station #5. All companies from this station will have the number 165. There might be a "Ladder 165", "Brush 165" and an "Engine 165". Labor laws establish how many hours a worker can work, in a given period, before the employer is required to pay overtime. For firefighters this amount is set at 53 hours a week. This does not mean that a firefighter gets overtime pay the instant he or she works over 53 hours in a week. For a 24/48 schedule this would amount to 19 hours of OT every third week because on two weeks the firefighter would work 48 hours but on the third it would be 72. This amount can be an average of hours in a set time period. But even this would an be average of 56 hours a week. Something must be done to avoid paying that 3 hours a week overtime. (Although some departments do just pay it.) Many departments use a four week pay period. As long as the firefighter does not average over 53 hours a week, in that period, the employer is within the law. What usually occurs is that over a four week period about 12 hours of time is accrued. That is then matched with 12 hours of vacation or a holiday for a complete shift off. This amounts to getting about every 9th shift off. But this is not always the case. Some departments may choose a different schedule. In some departments, the union negotiates a contract that includes certain days off. For whatever reason, this is just a predictable time off from your regular shift. Where did the name come from? This is a question we get often. One "legend" is that there once was a worker who always took off (sick?) a particular day. Perhaps this was the Monday after he was paid for the month. Or it could have been based upon some other regular, predictable, event. The legend then goes on to suggest that this person's name WAS "Kelly". From that, the term was applied to a day off taken. "I'm taking a day off like Kelly." became "I am taking a Kelly day." Other legends have the chief who invented it named Kelly. Members of several departments have contacted me and proclaimed that it was in their city that the term was born. One has it named for a chief who "invented" it. Another says it was named for a mayor. I have had one person say that it went back to a specific person, named Kelly, in Ireland. We get more emails about this than just about any other subject. In simple terms it is how many times the fire commander, on the scene, has called for help. When a citizen reports a structure fire a predetermined response of firefighters and equipment is sent. This is usually something like: 3 Fire engines, a truck or two, and a battalion chief. 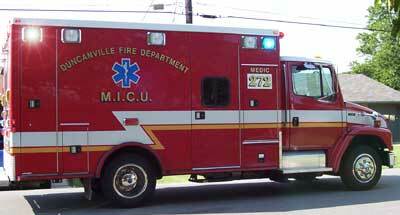 Some cities will also send an MICU on the first alarm. If the commander on the scene determines that more resources are needed he may call for a second alarm. This provides another predetermined response. This is usually slightly less than the "First Alarm". It might be two engines and a truck. Often a second Battalion chief is sent along with a district or assistant chief. Certain other support vehicles also might automatically be sent on the second alarm. Examples might be an R&R or Air filling vehicle. Subsequent alarms will get a similar response. A scene commander can special order any type or number of equipment. He might call for another truck or just for air. He might ask for several pumpers to fight a grass fire. It is not uncommon for four engines to be fighting the same brush fire. This does not constitute even a first alarm unless he stated, for some reason, that he wanted a first alarm response. - "First alarm Haz Mat response" This may get one Haz Mat Team and some predetermined support people. - "First alarm brush response." 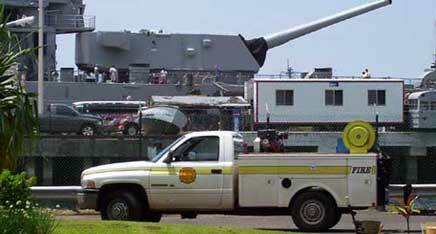 This might get a certain number of vehicles, and support personnel, for fighting wildland fires. Both of the above may have second alarm versions also. It should probably just be called "turnout". To use the term "turnout gear" is possibly redundant. That is like saying "equipment tools." Turnout can simply mean gear, or equipment. Roget's Thesaurus gives Synonyms of 'turnout' as. "Things needed for a task, journey, or other purpose: accouterment (often used in plural), apparatus, equipment, gear, material (used in plural), materiel, outfit, paraphernalia, rig, tackle, thing (used in plural)." Some readers gave their opinion on this. Here is one such response. "Here's something of what I've told folks before, when asked that. The term is used around Society, for various things, like 'how/what was last night's turn-out'. It's roots go back ages, for that kind of meaning, as in attending a thing, etc. Now that can also be used in our settings as well. And I do use some of these terms sometimes (troopies think I'm funny anyway, haha), just so troops hear and keep terms in the Industry. I definitely like using them when instructing somewhere. So, I'll say '....when we turnout for a ....' or something like that, so it's heard in conjunction with the activity. There are uses however, where the term has been used for various gear and stuff, in horse and buggy days. If this was common speak then, it was most likely adopted or adapted both for responding, AND for the responder's stuff (stuff: my technical term)." We also looked up the word in a dictionary. It had several meanings. Look at definitions #1, #6, #10 & #11. They seem to apply to the fire service. 1. a gathering of people; assemblage. Ex. There was a good turnout at the picnic. 2. the quantity produced, as by an industry, shop, or machine; total product; output; yield. 3. a wide place in a narrow road, where vehicles can pass. 4. a similar place in a canal. 6. the way in which somebody or something is equipped; equipment; outfit. 7. a horse or horses and carriage; driving equipage. 8. the action of turning out. 9. (British Terms.) a. a strike. b. a worker on strike; striker. 10. the act of getting out (of bed or a barracks). 11. a call to duty, especially during one's period of rest. 12. (Ballet.) a position in which the legs are completely turned outward, the feet forming a straight line with heels together. Click here for use quidelines. Most Action or Apparatus Photos Copyright© Ben Saladino. Most photos since November 2002 taken with Nikon Coolpix 5700.